Based on the championship winning R1, the incredible R1M is the pinnacle of Yamaha's pure racing technology. It provides a riding experience like nothing before it. Power delivery is very linear and controllable with our comprehensive YRC electronic controls. Add in premium features including an Ohlins Electronic Racing Suspension, lightweight carbon fiber bodywork and our Communication Control Unit that is both a data logger and data setting tool, and you have a machine that is destined to improve racing skills and results. 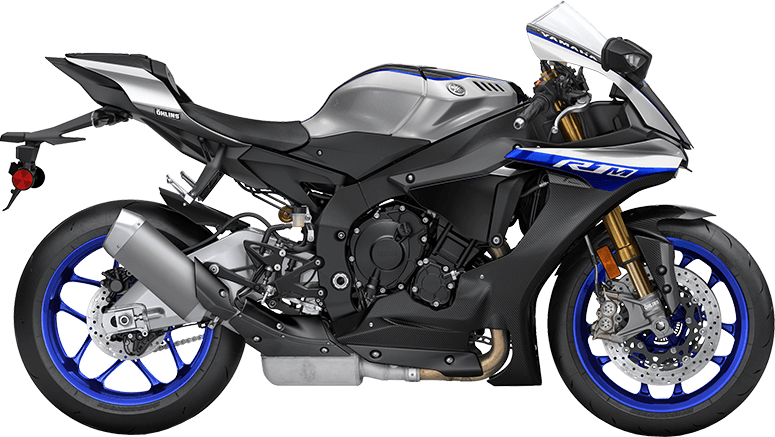 The Yamaha R1M comes equipped with electronically adjustable, premium Ohlins "Electronic Racing Suspension" with 120 mm (4.7") of wheel travel front & rear. Electronic Racing Suspension also further enhances the performance potential of the R1M with electronically controlled independent damping front & rear. Standard on the R1M are magnesium wheels, oil pan, cylinder head cover & crankcase covers. The lightweight design reduces unsprung weight & contributes to excellent suspension & handling performance. The R1M has everything from a Launch Control System (LCS) to Slide Control System (SCS).Many of the rider assist aids are derived from Yamaha's MotoGP race efforts and help make the R1M more controllable and enjoyable to ride..